i still need some time to digest all the stuff that happened in berlin. ps: i didn´t do much sale shopping this season but this silk kimono really was a steal! from 120 euros down to 29! yessir. ANJELICA this outfit is perfect ! Seriously I want everything !!! I think you've become my favorite blogger ever ! You always buy the things I dream of and the shoes I'll never have ! The kimono is such an amazing find! I love it. So beautiful. Girl, you look killer gorgeous! That kimono is a true beauty, and your boots are sky-high and mesmerizing! Everybody's wearing kimono's these days,guess it's a new trend:-)Love the outfit,hun! 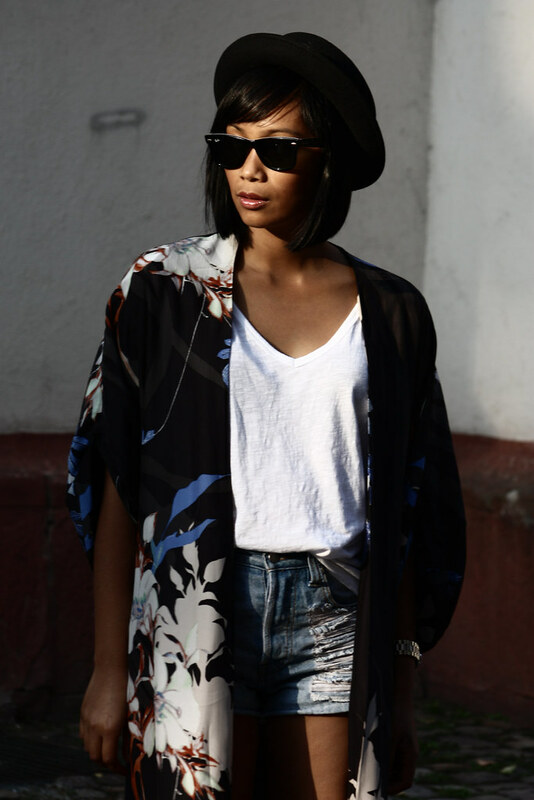 love the Kimono+denim cut offs! gorgeous photos as always, and that kimono is so beautiful! 5 inches and up did a look like this, and I'm STILL obsessed with it! this Kimono. I need it in my life. I just can't make my mind on the short or the long one. Uh OH! Loving the kimono giiirl! Have a great week, A.
Wow, that kimono is SUCH A GREAT FIND!! And I love those shoes with it! Great look! Those shoes are everything! You look amazing in that kimono!! Love your shoes too, obviously! amazing!!! you have a great style!! Amazing outfit! I love this kimono. Only you can wear it like this! It's funny but a few days ago I used the same kimono for an outfit post in a very similar way. You look great. Looks like we have much in common. A crazy and amazing outfit!! Yay for new opportunities:) good luck with everything. I looove the silk and uuuuuh yeah that's a TOTAL STEAL!!!! Good for you:) You look so stunning I'm so jealous! I mentioned you on my blog today. love this outfit, the shoes are amazing as usual ! heey there, amazing outift!! as I told you some days ago I ordered the zoe boots at endless.com 'cause somehow it didn't work at lori's shoes.. anyways, I got them within 3 days and didn't have to pay a shipping, but a import fee deposit or I don't know how it's exactly called... so it was like the price at lori's (including the shipping costs there) but without any extra taxes which I had to pay at the door..